So, if I haven't said it before, I have had a complete obsession for Alexander McQueen's fashions for many years. I laid out almost an entire paycheck for the beautiful flower petal sandals that went down the runway in his fall 2009 runway show. As I've already explained, I have a shoe problem...when it intersects with a McQueen problem....stand back! And his sudden and senseless death last year left me (and so many others in the fashion world) stunned and broken hearted. All of this explained.......you will all understand when I was thrilled to see that (as NY Magazine reports) our fashionable first lady was dressed in McQueen for the China state visit (especially since I just left DC!) PS, why is the Premier not in black tie? 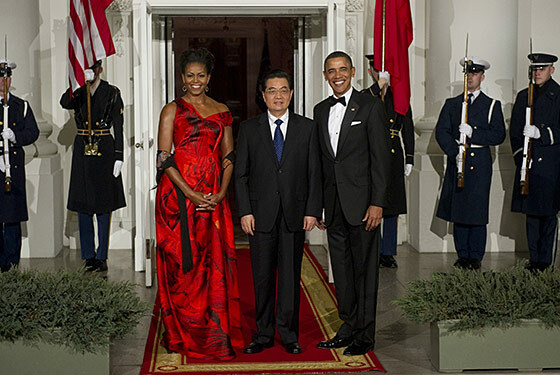 Does it not indicate appropriate dress on the State Dinner invite? Maybe something to fix, Mr. President? So, tonight's post is a little bit politics, a little bit etiquette, a lot of fabulous!